"Patriarchate of Alexandria" redirects here. For other uses, see Patriarchate of Alexandria (disambiguation). The Patriarch of Alexandria is the archbishop of Alexandria, Egypt. Historically, this office has included the designation "pope" (etymologically "Father", like "Abbot"). The Alexandrian episcopate was revered as one of the three major episcopal sees (along with Rome and Antioch) before Constantinople or Jerusalem were granted similar status (in 381 and 451, respectively). Alexandria was elevated to de facto archiepiscopal status by the Councils of Alexandria[which? ], and this status was ratified by Canon Six of the First Council of Nicaea, which stipulated that all the Egyptian episcopal provinces were subject to the metropolitan see of Alexandria (already the prevailing custom). In the sixth century, these five archbishops were formally granted the title of "patriarch" and were subsequently known as the Pentarchy. Due to several schisms within Christianity, the title of the Patriarch of Alexandria is currently held by four persons belonging to different denominations: the Greek Orthodox Patriarch of Alexandria, the Coptic Orthodox Patriarch of Alexandria, the Melkite Patriarch of Antioch, Alexandria, Jerusalem, and all the East and the Coptic Catholic Patriarchate of Alexandria. It was also previously held by the Latin Patriarch of Alexandria. Each of those denominations consider their patriarch as the successor to the original early bishops of Alexandria. According to church tradition, the patriarchate was founded in 42 AD by Mark the Evangelist. It was the centre from which Christianity spread throughout all Egypt. Within its jurisdiction, during its most flourishing period, were included about 108 bishops; its territory embraced the six provinces of Libya Superior, Libya Inferior, the Thebaid, Egypt, Heptanomis, and Augustamnica. In the beginning the successor of St. Mark was the only metropolitan bishop, and he governed ecclesiastically the entire territory. As the Christians multiplied, and other metropolitan sees were created, he became known the arch-metropolitan. The title of patriarch did not come into use until the fifth century. Up to the time of the First Council of Constantinople (381) the Patriarch of Alexandria ranked next to the Bishop of Rome. By the third canon of this council, afterwards confirmed by the twenty-eighth canon of the Council of Chalcedon (451), the Patriarch of Constantinople, supported by imperial authority and by a variety of concurring advantages, was given the right of precedency over the Patriarch of Alexandria. But neither Rome nor Alexandria recognized the claim until many years later. During the first two centuries of our era, though Egypt enjoyed unusual quiet, little is known of the ecclesiastical history of its chief see, beyond a barren list of the names of its patriarchs, handed down to us chiefly through the church historian Eusebius. All denominations acknowledge the succession of church leaders until the time of the monophysite Second Council of Ephesus (the so-called "Robber Council") of 449 and the orthodox Council of Chalcedon in 451, which gave rise to the non-Chalcedonian Coptic Orthodox Church of Alexandria and the Chalcedonian Greek Orthodox Church of Alexandria. 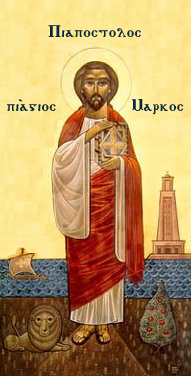 "Papa" has been the designation for the Archbishop of Alexandria and Patriarch of Africa in the See of Saint Mark. [contradictory] This office has historically held the title of Pope—"Παπας" (papas), which means "Father" in Greek and Coptic—since Pope Heraclas of Alexandria, the 13th Alexandrine Bishop (227–248), was the first to associate "Pope" with the title of the Bishop of Alexandria. The word pope derives from the Greek πάππας "father". In the early centuries of Christianity, this title was applied informally (especially in the east) to all bishops and other senior clergy. In the west it began to be used particularly for the Bishop of Rome (rather than for bishops in general) in the sixth century; in 1075, Pope Gregory VII issued a declaration widely interpreted as stating this by-then-established convention. By the sixth century, this was also the normal practice in the imperial chancery of Constantinople. The earliest record of this title was regarding Pope Heraclas of Alexandria (227–240) in a letter written by his successor, Pope Dionysius of Alexandria, to Philemon (a Roman presbyter): "τοῦτον ἐγὼ τὸν κανόνα καὶ τὸν τύπον παρὰ τοῦ μακαρίου πάπα ἡμῶν Ἡρακλᾶ παρέλαβον." This is translated, "I received this rule and ordinance from our blessed father/pope, Heraclas." According to the Oxford English Dictionary, the earliest recorded use of "pope" in English is in an Old English translation (c. 950) of Bede's Ecclesiastical History of the English People, "Þa wæs in þa tid Uitalius papa þæs apostolican seðles aldorbiscop." In modern English, "At that time, Pope Vitalian was chief bishop of the apostolic see." The Pope of Alexandria and Patriarch of all Africa in the Holy See of St. Mark the Apostle leads the Coptic Orthodox Church of Alexandria, but has resided in Cairo since Christodoulos moved the residence in the mid-eleventh century. His full titles are Pope and Archbishop of the Great City of Alexandria and Patriarch of all Africa, the Holy Orthodox and Apostolic See of Saint Mark the Evangelist (Egypt, Libya, Nubia, Sudan, Ethiopia, Eritrea and all Africa) and Successor of St. Mark the Evangelist, Holy Apostle and Martyr, on the Holy Apostolic Throne of the Great City of Alexandria. The Greek Orthodox Patriarch of Alexandria and all Africa leads the Greek Orthodox Church of Alexandria. His full title is "His Divine Beatitude the Pope and Patriarch of the Great City of Alexandria, Libya, Pentapolis, Ethiopia, All Egypt and All Africa, Father of Fathers, Pastor of Pastors, Prelate of Prelates, the Thirteenth of the Apostles and Judge of the Universe". The Patriarch of Alexandria of the Copts, who leads the Coptic Catholic Church in communion with the Holy See, can also be granted the title of Cardinal Bishop by the Pope without compromising his patriarchal status. The Patriarch of Antioch of the Greek-Melkites, who leads the Melkite Greek Catholic Church in communion with the Holy See, also has the titles of Titular Patriarch of Alexandria of the Greek-Melkites and Titular Patriarch of Jerusalem of the Greek-Melkites. The Latin Patriarch of Alexandria was head of the titular Patriarchal See of Alexandria of the Roman Catholic Church, established by Pope Innocent III. The title was last held by Luca Ermenegildo Pasetto until his death in 1954; it remained vacant until its abolition in 1964. ^ "The Pope". Saint Takla Haymanot (Coptic Orthodox) (in Arabic). Alexandria, Egypt. Retrieved 25 October 2018. One or more of the preceding sentences incorporates text from a publication now in the public domain: Herbermann, Charles, ed. (1913). "Patriarch and Patriarchate". Catholic Encyclopedia. New York: Robert Appleton. ^ "Pentarchy". Encyclopædia Britannica. 26 January 2015. One or more of the preceding sentences incorporates text from a publication now in the public domain: Herbermann, Charles, ed. (1913). "The Church of Alexandria". Catholic Encyclopedia. New York: Robert Appleton. ^ Pamphilus of Caesarea (2012). The Sacred Writings of Eusebius Pamphilus (Extended Annotated Edition). Jazzybee Verlag. ISBN 978-3-8496-2152-0.